4rd Annual Monarch Butterfly release with Ed Wesely (Founder, Butterfly Barn) Tour the Tusten Heritage Community Garden and the entrance pollinator friendly gardens. Monarch life cycle brochure give away sponsored by a grant to the THCG from the Upper Delaware Scenic By-Way. Children welcome & encouraged. Local and regional vendors will have a variety of bee related goodies, including local honey, beeswax, candles, honey based food, bee friendly clothing, pollinator plants, natural soap and honey made cosmetics. Make sure to pop into the Main Street Merchants as well for even more honey based menus, honey wine, honey spirits, books and wonderful bee gifts! The Chi Hive and H. Smith and Co. team up for a pollinator seed bomb workshop! You'll learn how to create seed bombs that help honeybees and other pollinators! This workshop is for all ages, runs all day and $5 per person. Richie Mitchell from Bear Creek Organics will presenting a one hour seminar about gardening for honeybees and other pollinators. This crash course will help you plan a flower and veggie garden that benefits honeybees and other pollinators! Richie is an ecological consultant and designer. He creates custom food production systems for homeowners, small farms, and schools. His focus is on finding balance between the values and goals of the organization and the context of the land. His company, Bear Creek Organics, provides consultation, design, installation, and management of ecological edible landscapes. He has designed and developed multiple bee and butterfly gardens for homeowners and schools. Richie has a B.S. in Environmental Science from St. Michael’s College, VT, and a lifetime of experience growing food in the Northeast. He has worked under Dr. Elaine Ingham at the Rodale Institute as a Mycorrhizal Fungi Technician. In 2016, Richie received the Environmental Partnership Award from the Pennsylvania Environmental Council (PEC) for his work in the state. Get your best bee costume on, dress up the kids and even the dog! Prizes will be awarded for the best Adult, Kids and Dog costumes! Hosted at the Birch Garden, Ed Wesely (Founder, Butterfly Barn) will demonstrate how to tag Monarch Butterfly & the importance of tracking their annual migration to Mexico. Learn what you can do to support this & other endangered pollinators. Monarchs brochure give away sponsored by the Upper Delaware Scenic By-Way. Children welcome & encouraged. A panel of bee experts discuss beekeeping, gardening and the current problems facing bees and other pollinators. This year we have Master Beekeeper Frank Mortimer President of the NENJ Beekeepers Association, Master Beekeeper Pat Bono Founder of the NY Bee Wellness and Beekeeper Kyle Maio Founder of Brothers in Bees. This is discussion will be moderated by Charles Wilkin from 2 Queens Honey and there will be a public Q&A and the end, so get your questions ready! For more information on the panel discussion click HERE. 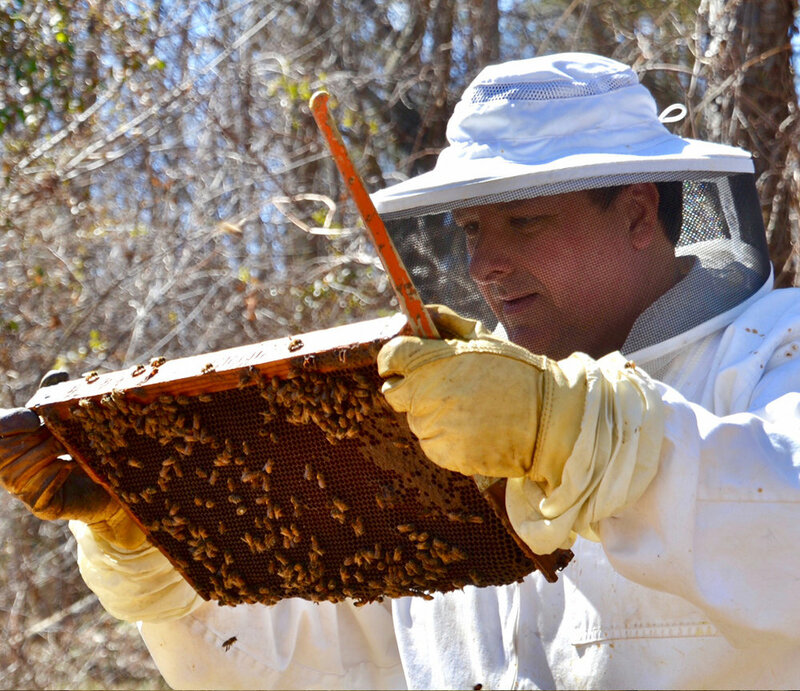 Master Beekeeper Charlie Kinbar returns again this year for a 1 hour crash course in beekeeping. Charlie is currently the President of the Northeast PA Beekeepers Association in Honesdale, PA and a former PA bee inspector. With over 30 plus years experience to share this class is not to be missed, perfect for both new and experienced beekeepers of all ages. The Wallenpaupack High School Marching Band joins us again this year, performing fun and bee inspired songs! 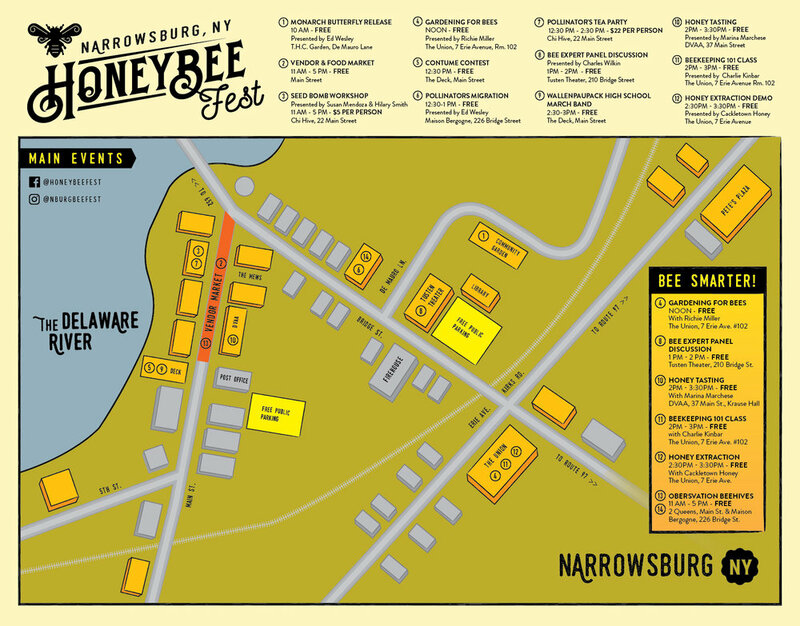 We are excited to announce Honey Sommelier Marina Marchese will return to the festival this year! She'll be hosting an incredible in-depth honey tasting. Participants will learn about the complexities of honey and how to identify floral sources and flavor profiles. As part of the experience she'll be pairing honey with a variety of foods, making this event a truly delicious and memorable experience! Marina is a member of the Italian National Register of Experts in the Sensory Analysis of Honey, where she received her formal training as a honey tasting expert. Her book, The Honey Connoisseur Selecting, Tasting, and Pairing Honey, co-authored with Kim Flottum (editor of Bee Culture Magazine) outlines the methods of sensory analysis to evaluate honey. Her book is the first in the U.S. to match floral sources to flavors by profiling thirty of the most important American honeys. Additionally, Marina created the first U.S. honey aroma and flavor wheel initiating a univocal glossary of honey sensory descriptors. In 2011, Marina establish The American Honey Tasting Society as the leading resource for honey sensory education in the United States, a ground breaking concept for creating a standard method for tasting and evaluating honey. 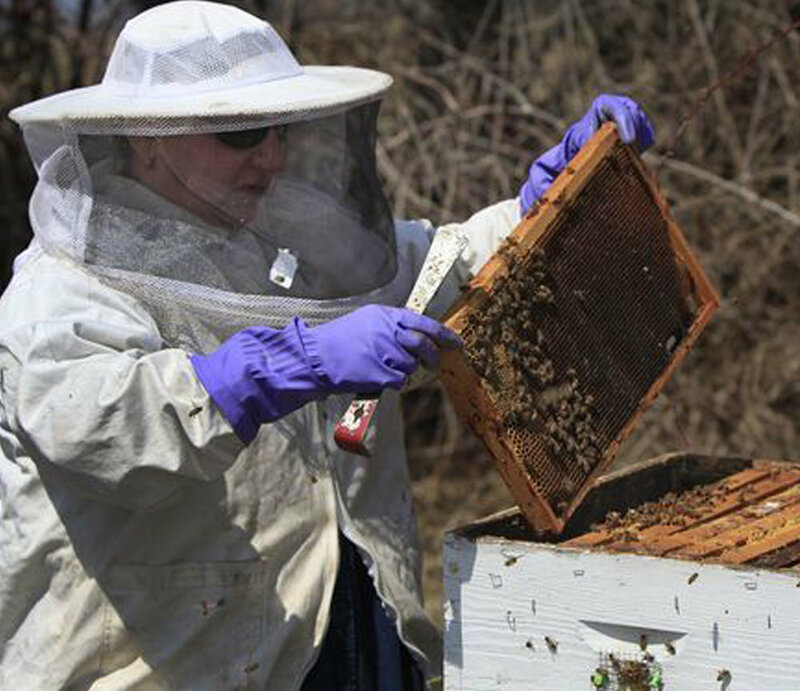 An accomplished apiculturist, having worked with honeybees for seventeen years, Marina has also successfully completed the Charles Mraz Apitherapy Course, twice with The American Apitherapy Society achieving a deep understanding of products of the beehive and their applications to health and healing. Susie and Rich from Cackletown Honey Farm return again this year to demonstrate the fascinating method of extracting honey from the comb! This has become ONE of the festivals most loved events, tasty too! We have two observation hives in two locations this year, stop by and peek inside a working beehive and see the amazing honeybees in action!